‘Tis the season… for cocktail parties, family get-togethers, work shindigs, and any other number of opportunities for you to hone your party-food skills. You want options that can be easily passed around, grabbed with one hand, and finished in a few bites; you also want a recipe that’s so memorably tasty people will demand you make it again and again. Shrimp cakes, made by chopping shrimp in the food processor, are great as a dinner option, but they’re one of our favorite dishes to make for parties, too. Not only are they a cinch to make, they’re incredibly tasty and, frankly, much less expensive than crab. (We love crab cakes! We do! But their price feels like you have to make them for An Occasion, with capital letters, and if you’re not wearing a tuxedo, you’re just wasting everybody’s time.) The best part about shrimp cakes is that you can flavor them any way you like. This Thai-influenced version of shrimp cakes is the one we go to most often. 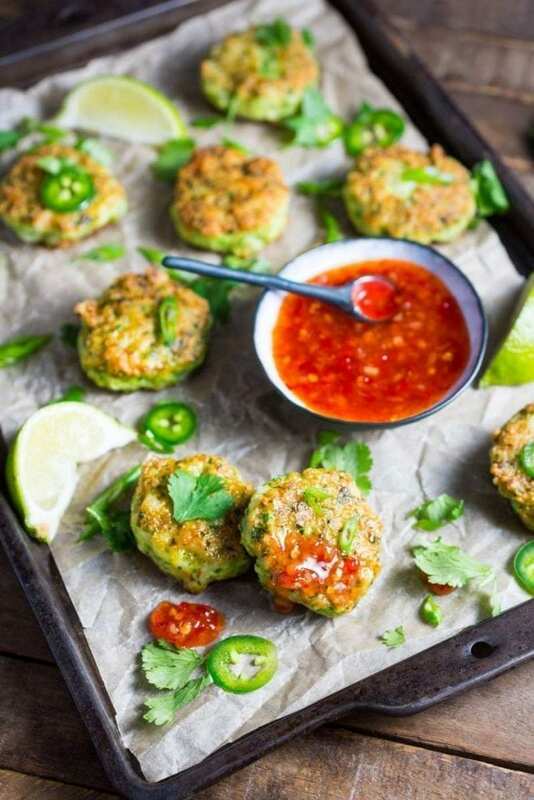 A generous amount of cilantro gives them a bright, fresh flavor and a beautiful green color. If you’re one of those cilantro-haters: (a) get out of our house, you monster; (b) parsley, basil, or mint (or a combination of all three) would be a fine substitution. We also add garlic, scallions, and lime zest to the mix. What about the shrimp themselves? Since they go into the food processor, this isn’t the dish to be splurging on jumbos, but do look for the best quality raw shrimp you can find. Truly fresh shrimp are great, but bear in mind that, more often than not, shrimp sold “fresh” at the supermarket fish counter are simply frozen shrimp that have been thawed for display. If you see the words “previously frozen” on the label, you’re better off buying the frozen bags and thawing them yourself. Thawing shrimp takes about 15 minutes in a bowl of cold water. 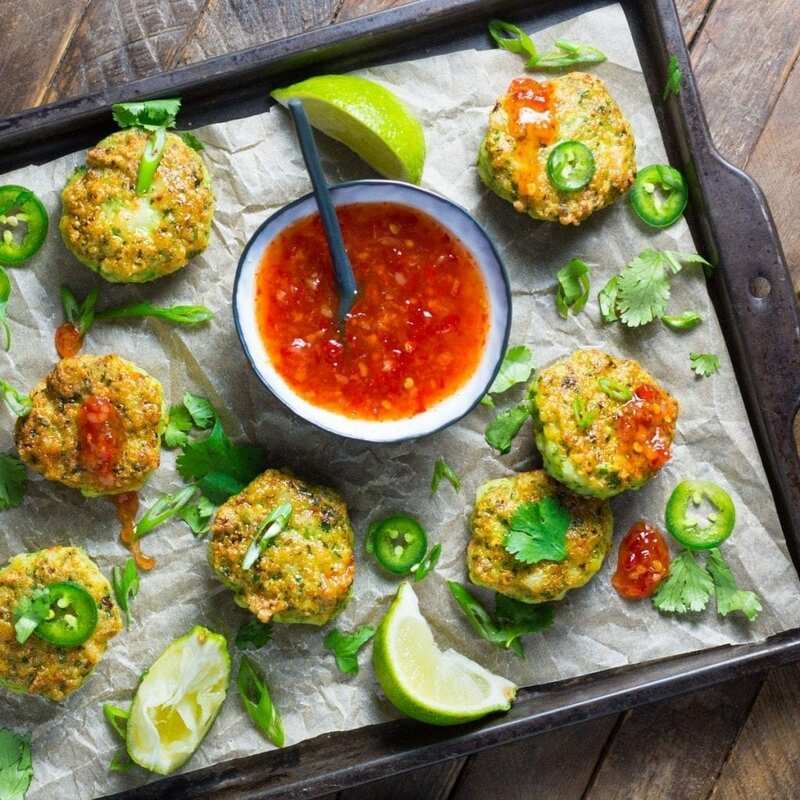 We like our shrimp cakes to have texture, but we also want them to hold together well during cooking, and to have some spring when you bite into them. To get there, we process half the shrimp fine and the other half to a coarser consistency. We also add a small touch of cornstarch, panko breadcrumbs, and egg white to help bind the mixture, and add a little mayonnaise for moisture. This gives us the best of both worlds: defined pieces of shrimp embedded in moist cakes that won’t fall apart. Using wet hands helps to keep the batter from sticking to your fingers as you shape the cakes. You can make them any size you like, but we’ve found that about 1 to 1 1/2 tablespoons of mixture is an ideal size for hors d’oeuvres. They fry up golden brown and juicy in minutes in a shallow layer of oil. For a more substantial bite, we often double up the portions and served the cakes on mini slider buns, with quick-pickled cucumbers and either the chili sauce or a spicy Sriracha-flavored mayo. For hors d’oeuvres, toothpicks (or fingers!) are just fine. Coarsely chop shrimp into ½-inch pieces. Set aside. Reserve a few tablespoons of sliced scallion greens for serving. Combine garlic, jalapeño, remaining scallions, cilantro, lime zest, and a large pinch of salt in the bowl of a food processor. Pulse until everything is finely minced. Add half of the shrimp, the mayo, the cornstarch, and the egg white. Pulse until the mixture forms a coarse paste, about 5 or 6 pulses. Add the remaining shrimp and pulse two or three times to combine everything. Some of the shrimp will be chunkier. Transfer the mixture to a bowl and add ¼ cup of the panko breadcrumbs. Fold in with a spatula or your hands. The mixture should be soft and should just hold its shape if you form a ball. If it’s too soft, add more breadcrumbs a little at a time until a ball just holds together. It will stiffen up more when it gets cold. Chill mixture for at least 30 minutes and up to a day. Once chilled, use wet hands and a tablespoon (or portioning scoop) to form the mixture into bite-sized patties. Transfer to a large plate as you go. When all the patties are formed, heat a few tablespoons of oil in a large skillet over medium high heat until shimmering. Fry patties in batches until golden brown and cooked through, turning once, 3 to 4 minutes total. To make the dipping sauce, mix sweet chili sauce, fish sauce and lime juice together. Serve warm, scattered with cilantro and finely sliced scallions along with dipping sauce.